Obituary – Lumbers, Robert Eugene « Perry High School Alumni Association, Inc. 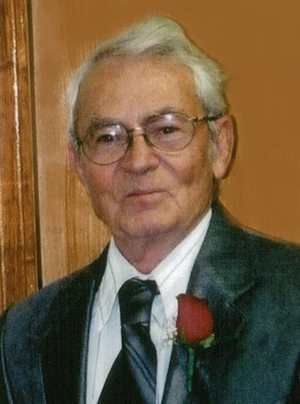 Lifetime Perry resident, Robert E. Lumbers, 87, passed away March 20, 2014 at his home in Perry. He was born February 17, 1927 in Stillwater, Oklahoma to George Avery and Mabel Grace Judy Stalter Lumbers. Robert graduated early from Perry High School class of 1945 and went into the Naval Academy boot camp in February 1945 and active duty in March of 1945. While on military leave in May 1945, Robert Lumbers was united in marriage with the late, Marjorie Spillman at the Rose Lima Church in Perry, Oklahoma and to this union, three children were born. Robert served overseas as a Seabee in Okinawa, Japan during World War II and was later honorably discharged May 1946. After the death of his first wife on March 14, 1996, Robert married Darlene Thompson in November of 2001 in Perry. She also preceded him in death on January 16, 2014. Robert worked for Midland Coop as a pumper for 20 years and later became a welder for Ditch Witch and RL Fraley. He was a member of the First Christian Church in Perry. He also was one of the founders of the Jaycees in Perry, and a member of the American Legion. Robert enjoyed farming, camping and teaching people how to weld. Robert is survived by his children, Sharon Skouby and her husband, Allan of Sunset, Texas, Michael Lumbers and his wife, Patty of Perry, Oklahoma and Bridget Stovall and her husband, Steve of Douglas, Oklahoma 7 grandchildren, Jay Yowell, Treg Yowell, Matt Lumbers, Luke Lumbers, Haley Jones, Crystal George, and Stephne Smith and 8 greatgrandchildren. He was preceded in death by his parents, his first wife, Marjorie and his second wife, Darlene. Funeral services will be 2pm, Tuesday, March 25, 2014 at the First Christian Church in Perry with Reverend Martin Foster officiating. Interment will follow in Grace Hill Cemetery. Memorials may be made to American Legion Post 53 in care of BrownDugger Funeral Home, 1010 N. 7th, Perry, OK 73077.